1. Grip the top of your club with your non-putting hand, placing your thumb on top of the grip. This will become your hinge. Placing the index finger down the back of the grip is also an excellent method. The index finger is the center of feel in the hand. 3. Brace the left elbow against your rib cage. It becomes the stabilizing factor in this method. It conforms to the USGA rules since your elbow and wrist are still free to articulate and the club is not anchored in any way. 4. Set up with your right foot forward (right handed putters). 5. 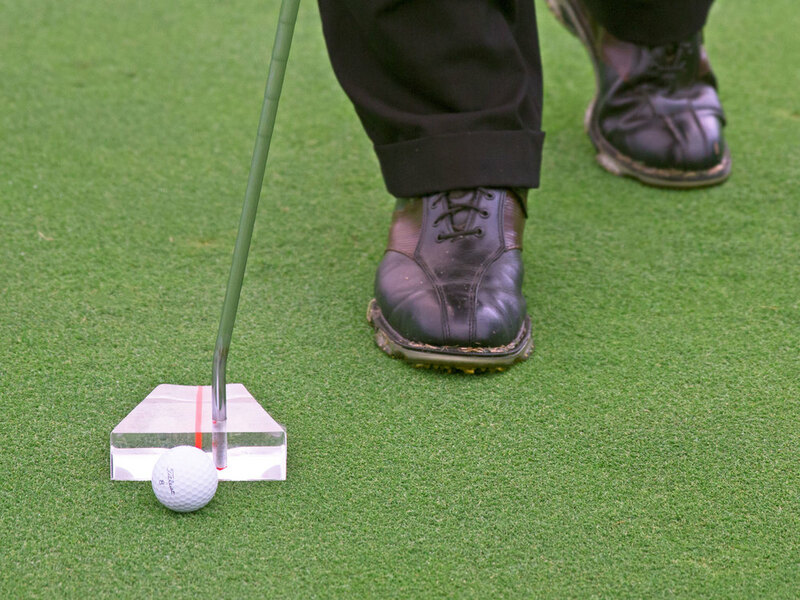 Place the ball about six to twelve inches in front of and to the outside of your right foot (right handed putters). The left hand is placed directly over the ball and away from your body. 6. Lean slightly to the outside of your foot to get your eyes in position. 7. Keep your head and eyes square to the hole. There is a tendency to want to rotate them into the old side-on position. 8. The only thought in this stroke is, "straight back, straight through." You can look at the ball while you learn the stroke. Eventually see if you can putt while looking at the hole. Either is fine. Looking at the hole should give you better feel for distance because you aren’t putting to a memory.